“We provide assistive technology, which simply means we assist people in using current technology, and if it is smaller, well, then we’re there to help and support their use,” said Jerry Wagstrom, semi-retired founder of Greystone Digital Inc./The BigKeys Company in Huntersville. But the company’s U.S. and European customer base isn’t limited to those with disabilities. It extends to educators, parents, software designers, computer retailers and such industrial sites as nuclear stations and auto manufacturers, where operators, dressed in hazardous-material suits, and assembly line workers, dressed with gloves, are able to use the oversized keys. 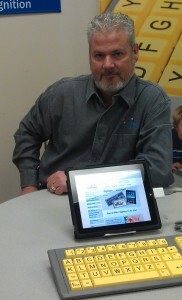 BigKeys sells 85 percent of its products wholesale to other dealers, specializing in vision, literacy and assistive technology. Jerry Wagstrom, a Minnesota native, has continuously been involved in the computer industry, remembering the 1960s computers as giant machines that only big businesses used. The introduction of the personal computer, he said, opened the door for him to use his creative skills that eventually led to the creation of Greystone Digital in April 1993, and the creation of BigKeys, which hit the market in May 1994. BigKeys, originally targeted for children ages 2 to 6, is a PC keyboard with oversized, colorful keys arranged in “alphabetical order,” which easily can be converted to the standard keyboard. In 1995, Wagstrom found a market for people working with disabilities when he had his first trade show. Today, his products include key guards (pre -set to eliminate keying mistakes) and keyboard skins (environmental protector that guards against spills). “Touch type is out of the question for many users, so if someone needs BigKeys to run a desktop or laptop computer, then it ’s almost ‘inappropriate ’ to think he/she can use small technology,” Jerry Wagstrom said.